​If you would like Cape Paterson to run any of the following training programs for your club or organisation please fill out the general enquiry form. Bronze camp is an opportunity for new and old members to gain their Surf Rescue Certificate or Bronze Medallion which allows holders to become Life Savers on beaches throughout Australia. 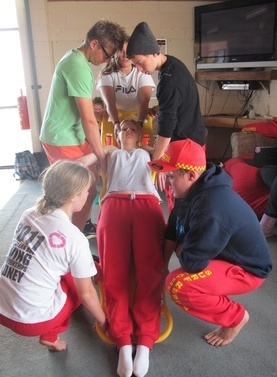 During the camp participants learn a variety of surf, first aid, resuscitation & rescue skills. 13 years old to do your Surf Rescue Certificate and be able to swim 200m in 5 minutes in a pool. 15 years old to do your Bronze Medallion and be able to swim 400m in 9 minutes in a pool. We run training camps for schools and for the general public. If you would like Cape Paterson to run a camp for your organisation please fill in a General Enquiry form. Enrolments for the 2019 Summer Bronze Camp are coming soon!! Watch this space!! Adult courses are also available that are flexible delivery, with theory training in Melbourne over weeknights and practical training done over weekends. The senior first aid course provides participants with the essential skills and knowledge required to manage life threatening emergencies until professional medical help arrives. This program educates participants in how to deal with medical emergencies arising from shock, bleeding, burns, fractures, soft tissue injuries, cardiac and respiratory emergencies, exposure, and poisoning. If you are interested in attending a first aid course for yourself, please see our calendar for upcoming courses. If you would like a course run for your organisation either at Cape Paterson or a location that suits you, please fill in a General Enquiry form. This course is designed for people who have never learnt first aid or CPR before. The course teaches you how to treat basic first aid including, bleeding, burns, fractures, soft tissue injuries and much more. Through this course you will also learn how to resuscitate someone in a major emergency until an ambulance arrives. 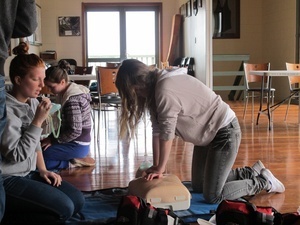 This course is available for ages 12+ and you could end up saving someone's life. Every season we run this course for our Nippers in the first weeks of January. Please make sure you come down to the first session of Nippers to hear all about the program. If you are interested in attending this course for yourself, we run it every January just after new years. If you would like a course run for your organisation or group either at Cape Paterson or a location that suits you, please fill in a General Enquiry form. The aim of the Advanced Resuscitation Techniques Certificate course is to develop your skills and knowledge to use oxygen, airway management devices, and automated external defibrillators during resuscitation, and to administer oxygen to conscious or unconscious breathing casualties. A course, run over 2 days is normally run in February every year at Cape Paterson SLSC, keep an eye on the notice board for the enrolment. We would be happy to run a course anytime for a group, if there is the demand. The spinal management course teaches you how to handle a spinal patient, from basic physiology, how spinal injuries occur, to fitting a spinal collar, strapping patients to boards and correct lifting and carrying techniques. This spinal management course also teaches you how to manage patients in an aquatic environment. This qualification can be used to gain employment as a pool lifeguard. A course, run over 2 days in conjunction with the ARTC award is normally run in February every year at Cape Paterson SLSC, keep an eye on the noticeboard for announcements. We would be happy to run a course anytime for a group, if there is the demand. The IRB Crew and Drivers award teaches you how to rescue patients using the boat. You will learn about the boat and the motor, how to care for them and how they work. You will spend plenty of time in the boats driving and crewing, and also learning theory about being safe in the IRB’s. The IRB's are a vital component of surf lifesaving and account for many of the rescues performed by lifesavers. An IRB training camp is run every year over the Labour Day Weekend in March at Cape Paterson SLSC. Please go to the enrolment forms for more course details. For more information, including how to enrol and pricing, click here.